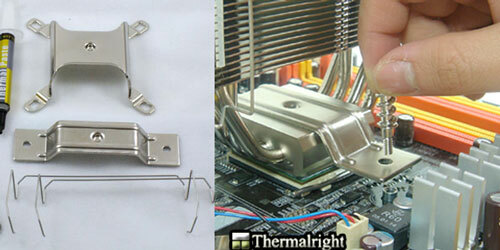 As we have said many times, Thermalright has never been one to invest in fancy packaging. 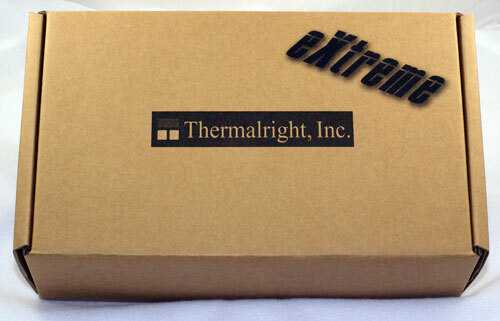 The usual Thermalright cooler comes in a sturdy brown box, with at least the name nowadays. 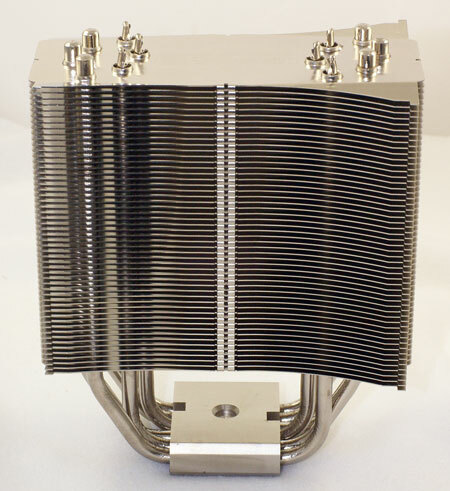 What's in the box is what really matters, and Thermalright has more often than not delivered some of the best coolers on the market. 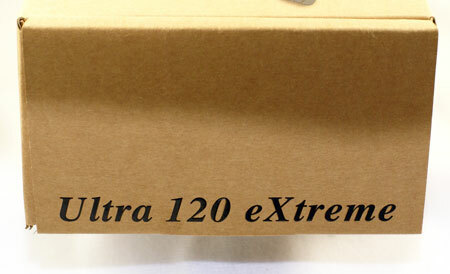 Thermalright is really proud of the Ultra-120 eXtreme, at least based on the final packaging. This is the first time Thermalright has used big 3-D Shadow print to announce the name. We looked closely, but we really couldn't find any difference in the prototype we tested and the retail eXtreme tower. Perhaps some sharp-eyed readers will find subtle improvements that found their way into the production eXtreme. The AM2 plate is the same, but the socket 775 plate is a complete redesign. The original 775 mount would not fit between the extra pipes of the eXtreme. The revised 775 mount folds, and is easily passed through the tighter pipes on the eXtreme. Once passed through the pipes, the 775 adapter is pushed open to align with the mounting holes. The back plate has also been slightly altered to allow better electrical isolation of the metal back plate. There are now elastomer pads on the motherboard contact surfaces. The new socket 775 adapter is certainly an improvement over the older design in terms of convenience, but we still have one complaint. 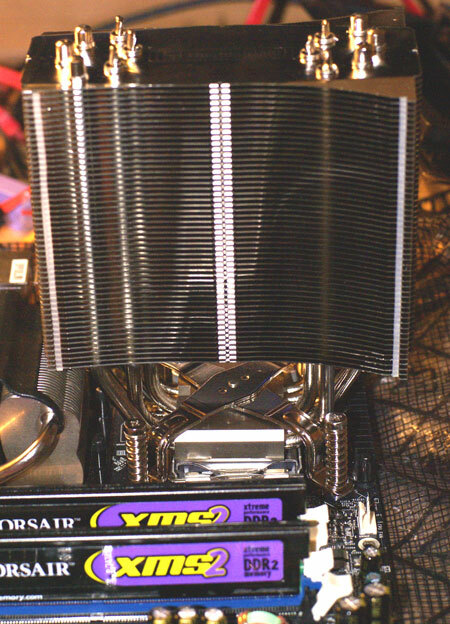 The old adapter held the cooler firmly in place on socket 775, while the new adapter allows the cooler to be turned a bit after mounting, whether intentional or accidental. 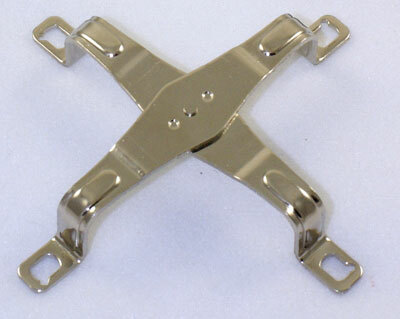 Buyers will be perfectly happy with the eXtreme's mounting and performance, but the 775 bracket could be improved further with wider metal on one of the blades that secures the cooler so it won't be able to turn. In this aspect the AM2 adapter is really sturdier, since the heatpipe tower is held rigidly in place on socket AM2 after mounting. It is also important to understand that the Ultra-120 eXtreme comes with AM2 and socket 775 adapters. However, it does not ship with the AMD 754/939/940 adapter. There is a 754/939/940 adapter (K8) in the Ultra-120 kit. It will also fit the eXtreme so that it can be used on the slightly older AMD sockets. 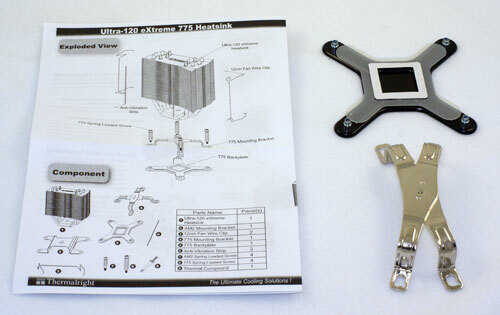 If you want to use the eXtreme on an AMD 754/939/940 processor you will need to ask Thermalright to sell you the Ultra-120 AMD K8 adapter, or talk your dealer or a U120-owning friend into helping you out.